From Ipanema Beach to Corcovado mountain, the natural beauty of Rio de Janeiro is self-evident. It’s almost as if the postcard itself was invented to honor this coastal city, with its lagoons, forests, and tropical climate. But the same could also be said for the album, as this city has birthed musical styles such as bossa nova, samba and choro. Indeed, elements of these musical styles can be traced to Africa, but there is no mistaking that Rio’s artistic identity is partly defined by these rich genres. Rio’s musical traditions are the very grist for this production. Delicado is a tribute to the music of this renowned and beloved city. “We wanted to honor the exuberant nature and welcoming spirit of the cariocas,” said Carlos Barbosa-Lima, the guitar maestro and leader of this production. So, he with his fellow musical partners selected several compositions that were written by cariocas or by those familiar with Rio. And what a band Carlos has gathered: Larry Del Casale (guitar), Duduka da Fonseca (percussion), Nilson Matta (bass), and Helio Alves (piano). All four of them have been frequent prior contributors to ZOHO CD releases, most notably recently Duduka Da Fonseca and Nilson Matta on their 2016 Grammy nominated Trio Da Paz “30” ZOHO (ZM 201602). Tico Tico by Zèquinha de Abreu (1880-1935) is the name of a migrating bird that came from Portugal to Brazil and settled in the early 1900s. This bird inspired de Abreu to write this exciting tune that became an international hit in the early 1940s. This arrangement is for two guitars and incorporates the choros style with up-tempo chorinho. There is a colorful interlude with terrific and well-placed percussion effects by Duduka Da Fonseca. The title track Delicado, composed by Waldyr Azevedo (1923-1980), the Brazilian composer and master of the choro music form. He was also virtuoso of the cavaquinho, the small four string guitar, similar to a ukulele. He wrote this song in the 1950s, and it became a sensation around the world. Its rhythm is known as the xaxado, which is a style related to the baiao. This arrangement features both guitars playing the melody, with Barbosa-Lima also playing the bassline throughout. The up-tempo feel is accented with da Fonseca, percussion, and Alves’s elegant piano touches. Samba de Orfeu is by Luiz Bonfá (1922-2001), a Brazilian composer and guitarist. This piece is played during the climax of the Orfeu tragedy in the iconic 1959 film “Black Orpheus,” which was based on a play by Vinicius de Moraes who adapted the story from Greek legend. Orfeu is pushed from the top of a hill and tumbles to his death. The up-tempo samba rhythm was an all-aboard experience for Barbosa-Lima, as the whole band enriches this number in a magnificent manner. A Felicidade by iconic Brazilian composer, arranger, and pianist Antonio Carlos Jobim (1927-1994) is another seminal composition that is played through the 1959 movie “Black Orpheus”. This piece is a moderately paced samba, and Barbosa-Lima’s rendition deftly incorporates new sonorities and a solid rhythmic bass. The coda adds a colorful ending that evokes the mystical spirit of Carnaval. Manhã de Carnaval is again by Luiz Bonfá, the Brazilian composer and guitarist. This piece is played at a dramatic point in the film “Black Orpheus”. We hear this song when Orfeu, a character in the movie, loses everything but wants to retain his guitar at an auction. “It’s one of the most beautiful songs ever written in Brazil,” says Barbosa-Lima. And indeed, his arrangement is both soulful and searing. Odeon was written by Ernesto Nazareth (1863-1934), an influential Brazilian composer. The piece incorporates elements of maxixe and merges polka into a style he termed “tango brasileiro.” It was meant as a tribute to the first movie theater in Rio during the twentieth century. Barbosa-Lima arranged the piece for solo guitar in the same key as the original first piano version. Manha de Carnaval is again by Luiz Bonfá (1922-2001), the Brazilian composer and guitarist. This piece is played at a dramatic point in the film “Black Orpheus”. We hear this song when Orfeu, a character in the movie, loses everything but wants to retain his guitar at an auction. “It’s one of the most beautiful songs ever written in Brazil,” says Barbosa-Lima. And indeed, his arrangement is both soulful and searing. Interrogando is by João Pernambuco (1883-1947), a Brazilian composer and self-taught guitarist. He went to Rio during the late 1800s and had a close friendship with Villa-Lobos, the pre-eminent Classical Brazilian composer of the first half of the 20th century. Barbosa-Lima’s arrangement of this piece respects the original format over a jongo rhythm, and alternates playing as if there are questions and answers. Feitiço da Vila is by Noel Rosa (1910-1937), a Brazilian composer-songwriter. He was a doctor who died young at the age of twenty-six, before the invention of penicillin. The title means “bewitching villa,” and it’s about Vila Isabel, a northern area of Rio. Barbosa-Lima’s arrangement incorporates polyphony supported with a clear bass. Samba do Avião by Antonio Carlos Jobim was written when he arrived in Rio, as he was excited by his beloved city. Barbosa-Lima’s arrangement adds rhythmic intricacies that helps the overall swing, undoubtedly enriched by the other members of the band. Sambolero by Luiz Bonfá - was a dear friend of Barbosa-Lima since he was nine years old. “Luiz introduced me to his teacher Isaias Savio. Luiz was so creative and was able to merge his classical playing with more polyphony to create colorful effects,” said Barbosa-Lima. This piece is a tribute to the merging of the bolero style from all Latin America with the samba-cancao tradition that evolved in the 1950s. 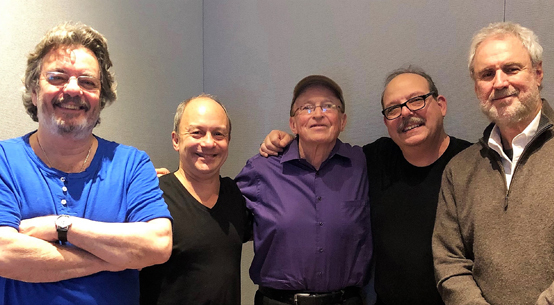 Duduka Da Fonseca, Helio Alves, Carlos Barbosa-Lima, Larry Del Casale, Nilson Matta. Photo by Ze Luis Olivera. Chovendo na Roseira was also composed Antonio Carlos Jobim. It’s an undulating jazz waltz, and it’s about the rain’s effect on the people of Rio. “This is one of Jobim’s masterpieces,” said Barbosa-Lima. Both he and Del Casale deftly take turns playing the melody to create a stirring rendition of this classic number. On Prelude to Canto de Ossanha, famed Brazilian drummer Duduka Da Fonseca introduces the berimbau, a one-stringed percussion instrument which almost looks like a hunting bow. Duduka’s astringent, rhythmically inventive solo creates the perfect counterpoint to the melodically rich composition that follows it. Canto de Ossanha was composed by Brazilian guitarist Baden Powell (1937 - 2000) and poet/lyricist Vinicius de Moraes (1913-1980). They both were intrigued by Afro-Brazilian roots and this piece evokes these elements. “I knew Baden Powell well and performed with him. He was a warm person and incredibly creative,” said Barbosa-Lima. The music begins with Barbosa-Lima bending guitar strings to draw a percussive effect. Eu Não Existo Sem Você by Antonio Carlos Jobim is a haunting piece in the samba-cancao style. Barbosa-Lima arranged the piece for two guitars, and both exchange the leads, and musical flow is never interrupted. With textural percussion, a bittersweet sentiment is present throughout. The Debussy-like coda is both historical and contemporary, with a becoming harmony that fades into resolution. Tristeza by Haroldo Lobo (1910-1965) and Niltinho (1928-2014) was a big hit in the 1966 carnaval, and it has remained popular. Barbosa-Lima is adding contrapuntal harmonies and classical techniques to this composition. The introduction is a taste of modern Rio, at times noisy (and marred by social unrest), but it gives way to a more harmonious middle section, a reminder of the exuberant nature of this beautiful city. It has been a privilege of a lifetime to help produce this album. 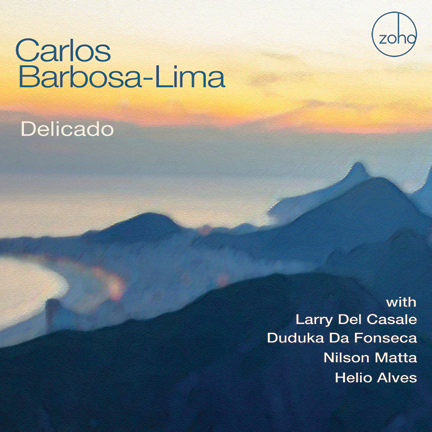 Performed by virtuosos Carlos Barbosa-Lima and his collaborators, this album has a timeless feel to it. The first time I performed with Carlos Barbosa-Lima was in 2003 at Weill Recital Hall at Carnegie Hall. We performed his wonderful guitar duo arrangement of Antonio Carlos Jobim’s “Luiza”. Since that evening, we have performed together as a duo all over the western hemisphere. We also recorded together for ZOHO on Carlos’ albums “Beatlerianas” (ZOHO ZM 201304) and “Carlos Barbosa-Lima plays Mason Williams” (ZOHO ZM 201610). Carlos is a giant amongst guitarists. His arrangements on Delicado are subtle, sophisticated and virtuosic, taking his harmonic language to a new level. To expand on these arrangements, we enlisted some of the greatest Brazilian jazz musicians performing and recording today. Working with them was a dream and an honor. Therefore, a big abraco to the musicians, engineers, Kabir, ZOHO Music, and my dearest friend who inspires me to play my very best, Carlos Barbosa-Lima! Produced by: Larry Del Casale, Kabir Sehgal, Paul Avgerinos. Co-Producer: Kenya Autie. Project Concept by: Kabir Sehgal, Carlos Barbosa-Lima. All Arrangements by: Carlos Barbosa-Lima. Recorded at: Alchemy Post Sound, Peekskill, NY by recording engineer Leslie Bloome in June 2018; and at Ze Luis Studios, Queens, New York by Iuri Oriente and Ze Luis Olivera, between September and December 2018. All Tracks Mixed by: Oscar Autie, El Cerrito Studio, El Cerrito, CA. Mastering by: Oscar Autie, El Cerrito Studio, CA. “Favela” Painting in Inner Traycard: Jaren Morganelli. Photo Carlos/Larry: Angelo Mannino. Group photo: Ze Luis Olivera. Art Direction and Package Design by: Al Gold. Executive Producers: Kabir Sehgal, Joachim "Jochen" Becker.